Tadalafil is an orally administered drug used to treat male erectile dysfunction (impotence). It was initially developed by the biotechnology firm ICOS and subsequently developed and marketed worldwide by a joint venture of ICOS Corporation and Eli Lilly and Company (Lilly ICOS LLC) under the brand name Cialis. In the United States, tadalafil has Food and Drug Administration approval and became available in December, 2003 as the third impotence pill after sildenafil (Viagra) and vardenafil (Levitra). Due to its 36-hour effect it is also known as the weekend pill. As with sildenafil and vardenafil, it is recommended that tadalafil be used no more than once daily. Although Viagra, Levitra, and Cialis all work by inhibition of phosphodiesterase type 5 (PDE5), tadalafil's distinguishing pharmacologic feature is its longer half-life (17.5 hours) compared with Viagra and Levitra (4-5 hours). This longer half-life results in a longer duration of action and is, in part, responsible for the Cialis nickname of the "weekend pill." This longer half-life also is the basis of current investigation for tadalafil's use in pulmonary arterial hypertension as a once-daily therapy. Penile erection during sexual stimulation is caused by increased penile blood flow resulting from the relaxation of penile arteries and corpus cavernosal smooth muscle. This response is mediated by the release of nitric oxide (NO) from nerve terminals and endothelial cells, which stimulates the synthesis of cGMP in smooth muscle cells. Cyclic GMP causes smooth muscle relaxation and increased blood flow into the corpus cavernosum. The inhibition of phosphodiesterase type 5 (PDE5) enhances erectile function by increasing the amount of cGMP. 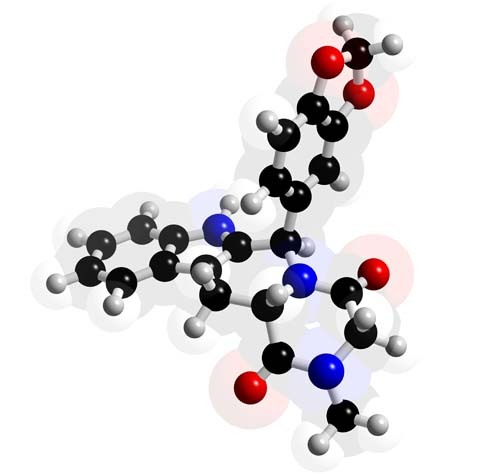 Tadalafil (as well as sildenafil and vardenafil) inhibits PDE5. Because sexual stimulation is required to initiate the local release of nitric oxide, the inhibition of PDE5 by tadalafil has no effect in the absence of sexual stimulation. The recommended starting dose of Cialis in most patients is 10 mg, taken as needed before anticipated sexual activity (but no more than once daily). The dose may be increased to 20 mg or decreased to 5 mg, based on individual efficacy and tolerability. To avoid the inconvience of men with erectile dysfunction needing to plan use of Cialis around anticipated sexual activity, Lilly ICOS embarked upon a clinical development program to evaluate the benefits and risks of chronic (once-a-day) use. In June 2007, the European Commission approved low-dose (2.5 mg and 5 mg) Cialis to be used as a once-a-day therapy for men with erectile dysfunction.